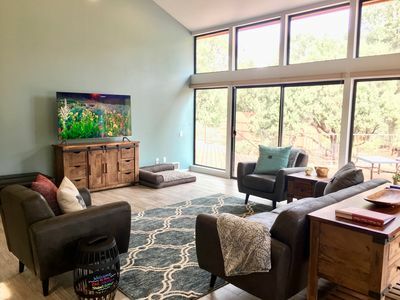 Enter into this newly remodeled home with a rustic yet modern, contemporary feel, and be swept away into the majestic red mountains of Sedona and the beautiful surrounding dog-friendly restaurants, shops, and art galleries. Tile floors, soft wood furniture and ceiling beams, and beautiful accents lend themselves to the warmth of this home. 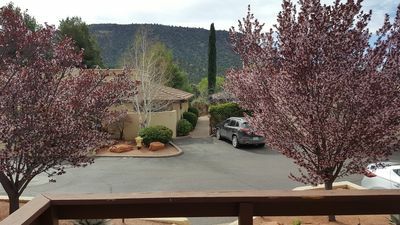 Our home is located in a cul-de-sac in West Sedona on more than a third of an acre., with floor to ceiling windows overlooking a large deck and a partial view of Thunder Mountain from the kitchen and living room. An inviting 200-square-foot wood deck is available for relaxing, stargazing, having a barbeque, or just enjoying the privacy and tranquil atmosphere this home has to offer. You can listen to the running water of the wash behind the house after a rain, or the morning conversation of the birds in the trees while enjoying your favorite beverage. 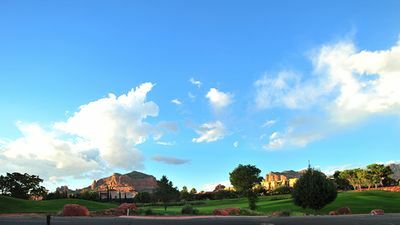 After breakfast, you are encouraged to explore the Mission Hills community on foot with views of Thunder Mountain, Coffee Pot Rock, Chimney Rock, and Sugarloaf Mountain only steps away. Our home was designed and furnished to exceed your expectations. The house includes a master suite with a beautiful king-sized velvet blue platform bed, a soaking tub, a double-sink marble-topped vanity, soft-close cabinets and drawers, a makeup mirror, a walk-in jetted shower, and an enclosed toilet room. 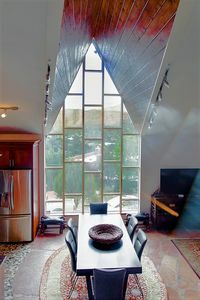 The bedroom also has floor to ceiling windows, two skylights, and a wood beamed cathedral ceiling, with access to the deck. Prepare for the day in the large walk-in closet with sliding door and plenty of light. After a long day of hiking, as daylight fades, sink into a bubble bath in the soaking tub and enjoy. 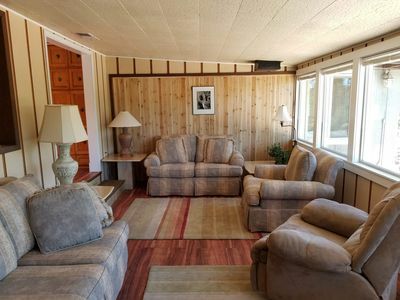 When you’re done, grab a heated towel off the warming rack and enjoy a nightcap in front of the 65” television or retire for a relaxing night’s sleep under luxurious bedding, including an alternative down comforter, with your special someone. The second bedroom contains a king-sized velvet grey platform bed with tones of grey, orange, and Sedona red. This bedroom contains a window that provides for amazing views of the sunset in the winter months, as well as a seating area and a separate entrance to the dog run. The lighted, extra-large closet provides plenty provides plenty of room for your belongings. Just steps away is a full bathroom with a bathtub/shower combo, with a marble topped vanity, soft-close cabinets and drawers, a makeup mirror, and an additional storage closet. 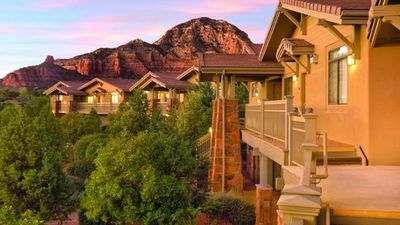 To enhance your stay, we have provided a detailed guest binder to help you make plans for meals, wine tasting, hiking, and other fun activities within the Sedona region. The binder contains a plethora of suggestions for hikes, tours, golf, grocery stores, restaurants, take-out and deliveries. It is designed to work with your Smartphone (via QR codes) to get you from point A to point B with as little effort as possible, while also providing the websites, phone numbers, and addresses for recommended locations. The binder contains lots of information and activities for your four-legged family members as well. 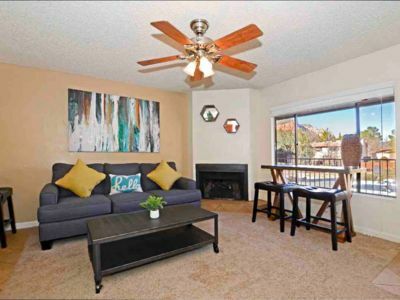 Our open-concept living room, kitchen, and dining room have been newly remodeled with comfort and simplicity in mind. The new couch and easy chairs are stylish yet comfortable and inviting, and the ottoman opens up into a twin-sized bed if needed. The living room contains a 65” smart TV, which has access to over 220 channels, a DVD player, and a host of your favorite streaming services available for you to log into and enjoy your favorite entertainment. The voice-activated remote control makes it easy to turn directly to your favorite channels. We also provide you with a selection of DVD movies and several board games for your entertainment. We offer complimentary Wi-Fi that can handle HD level streaming. Our home is also located in an area with strong cell coverage for the three major U.S. cellular companies, so no fear of missing a call, unless you simply choose not to answer it during your vacation. This is a great home for work trips as well. We have a desk, large monitor with cables, secure power supply, and high speed wifi internet. Secure and adequate bandwidth for VPN software. Up-to-date wifi Apple security and software that prevents prior renters from gaining access after check-out. The newly remodeled kitchen and dining room provide a sophisticated atmosphere where you can enjoy a lazy breakfast at the breakfast bar, a romantic dinner, or a casual snack night with friends. The spacious dining room and sustainably harvested Parota wood dining table, accompanied by the six upholstered chairs, provide seating for six people and allow for an elegant feel or an extended Monopoly game with friends. The well-stocked kitchen provides a host of common stainless steel appliances, various countertop appliances, dishes, a spice rack, and assorted pots and pans. 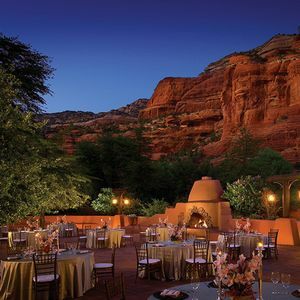 And if you simply don’t feel like cooking, Sedona’s restaurant scene will meet even the most sophisticated foodies’ requirements. Check out our binder for more information on grocery stores, restaurants, and delivery options. We have also pointed out a few dog-friendly restaurants as well. 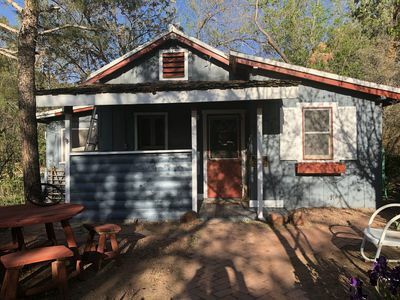 Our beautiful 200-square-foot patio is a wonderful place to relax, surrounded by forest scenery, where you can look up at the stars while enjoying the clean air and a nice glass of wine or beer as you let yourself drift away from the things of man. Be sure to contribute your wine corks to our wine barrel table in the living room. A gas grill on the patio is available for your outdoor cooking needs. 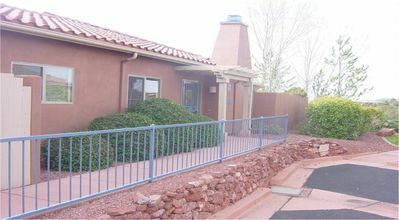 Our home has an oversized two-car garage, which also contains a brand new large capacity washer and dryer. The driveway can accommodate two additional cars; however, there is no street parking allowed. The side of the home has a 50-foot-long dog run that is completely fenced in and is accessible via a dog door in the dining room. This provides your dog with space to get outside and sniff while you prepare for your next adventure. 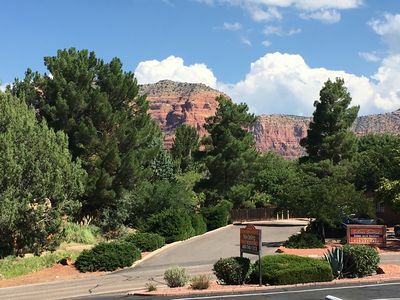 Our home is located within a 10-minute walk from the largest dog park in Sedona, with three sections to meet the requirements of any size, age, or personality. Hiking, golfing, shopping, ATV/off-roading, jeep tours, hot air ballooning, horseback riding, wine or beer tasting, glass blowing, star gazing, vortex healing – have we hit on something you enjoy yet? All of these things can be found within short driving distance from our home. 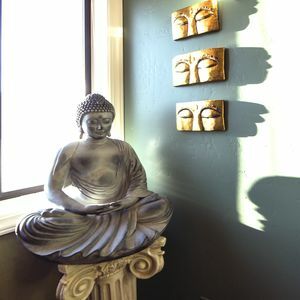 Whether you travel 5 minutes or 30 minutes, you are sure to find an activity to fit your mood. 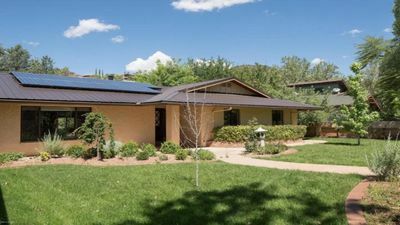 If you’re looking for an activity that is not listed in our informational binder, you can find it by searching the web or by watching the Sedona station that is preset on the TV in the living room. If you’d rather walk, you will find multiple restaurants, shops, bakeries, grocery stores, and numerous other options within a five to ten-minute walk. 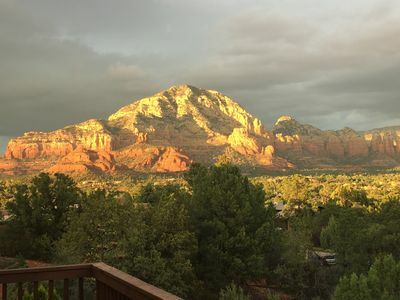 So, we looked long and hard for a second home in Sedona that we could share with others like us who enjoy taking their furry family members with them on vacation. 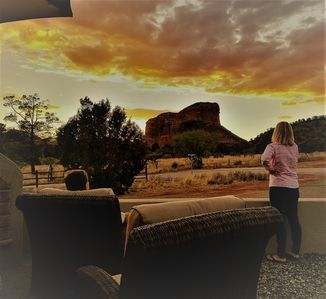 We have a German Shorthaired Pointer and a Redbone Coonhound that love to visit our home in Sedona, where they can see and smell all that this wonderful environment has to offer, and we love watching them enjoy it. We hope that you and your dogs will enjoy it as much as we do. 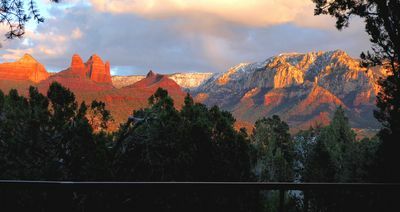 Sedona is all about the outdoors no matter what time of year. There are so many things to do and enjoy, there is something for everyone. 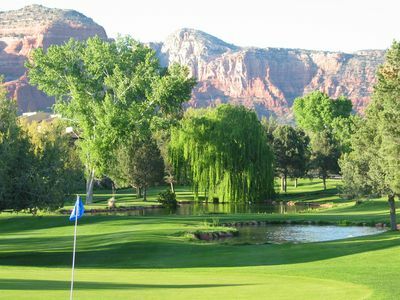 The Red Mountain Shadows Retreat is a great home base to begin your tour of Sedona, whether you’re here for hiking, sightseeing, dining, shopping, golfing, or self-healing. 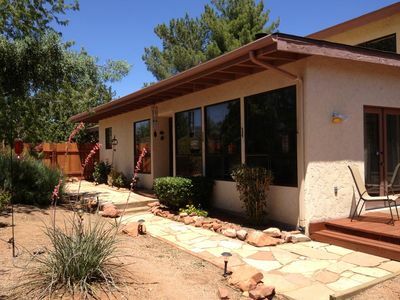 This home is suitable for couples, singles, friends, and children over the age of seven. To ensure easy payment processing, we have updated our terms to the minimum VRBO will allow, 25% due at booking and the remainder due 13 days before check-in. 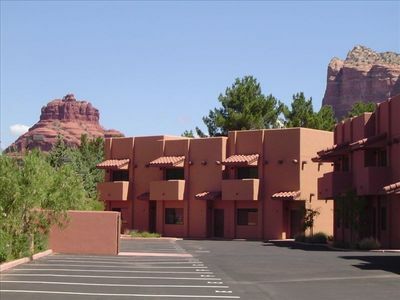 We look forward to your stay at the Red Mountain Shadows Retreat! 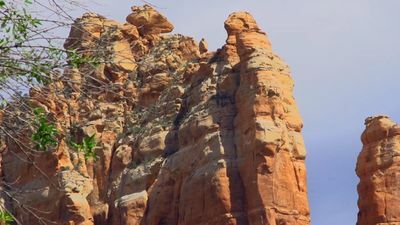 Visit breath taking Coconino National Forest! Come sight see in Sedona!